Life has been a whirlwind recently, with such a busy schedule and not much time to play. Then a funny thing happened, in the way that sometimes things just come together and everything works out to give you just what you need. First up though I'm going to show you the quilt I made for the Sewing Quarter last week, using fat quarters of Kaffe Fassett and a simple HST layout from Modern Baby Quilts by Fons & Porter. The dark background fabric allows the prints to shine and gives it a bold, modern feel. I really like this action shot of the quilt blowing in the wind. Wouldn't a wonky chevron quilt look cool?! So a couple of days earlier I received an email invitation to a beauty event, not something I would usually have time to attend but I realised that I would be travelling back into Manchester on Saturday afternoon anyway, and decided that it would be so good to do something just for me! That's a rarity and I was intrigued. The city centre was decorated for Halloween, and all around orange pumpkin lanterns hung from trees! It looked brilliant and it was lovely wondering around town and being able to really enjoy all the sights. I sat in the window of a coffee shop, people watched and chatted to the person sat next to me. The kind of thing I used to do as a student when I had a free afternoon! It was wonderful. The event was a celebration of the UK launch of American beauty brand Glossier. After seeing beauty bloggers rave about it, I placed an order online. Well, that arrived while I was working away so I actually went to the event before I had even seen the products. It was a lot of fun, friendly chats with other beauty loving women and free cocktails and canapes at The Living Room. The space itself looked gorgeous, decorated with pink roses and vines. They were kind enough to give me two tickets so my friend Michelle came along too and we each got a goody bag, including the Balm Dotcom and the bestselling Milky Jelly Cleanser. Both amazing! All the products come in the coolest pink bubble wrap pouches, which are reusable and totally useful. I had ordered Boy Brow and the Body Hero Daily Oil Wash. The Boy Brow is great, it gives a very natural look for everyday groomed brows but I've yet to try the wash. I was also sent a sample of their fragrance (which hasn't been released yet but smells incredible so I will be adding that to my next haul) and cute stickers. If you want to try Glossier you can click here to use my referral link and get 10% off your order. This post isn't sponsored, I just like the products - all dermatologist tested, hypoallergenic, non-irritating, paraben free and alcohol free, and not tested on animals. Many of the products are vegan too (you can contact them for the full list). Also, while I realise it's not the most important thing, I do appreciate the clean branded pink/white packaging! I am really glad I went. I easily could have passed it up. But I spent time with my friend, got a treat and discovered I was still worth it, even being *cough* years older than most of the other customers. Michelle and I went to have dinner at Wagamama, we had a good natter catching up and sharing dramas. She dashed off to avoid parking charges and I went to meet up with my family... who just so happened to be in Manchester at the same time! See how things sometimes just work out! The children had been invited to take part in a procession as part of the Dashehra Diwali Mela in Manchester. They were able to carry lanterns (one of which my eldest girl made at school). It was so magical, there were dancers and all kinds of creatures, a performance and fireworks. And then there was fabric. I had an order arrive from Simply Solids, Beast Mode in two colourways from the new collection Wildside by Libs Elliott. Love these colours, the leopard print and subtle touches of metallic. This fabulous quilting kit is by Trudi. I completely forgot to buy one while I was at Stitch Gathering but I'm grateful for instagram + paypal + Trudi kindly posting it to me! I adore the Oakshott Herringbone fabric and I'm looking forward to stitching the design. I'm still not sure if I will do fmq or hand quilting...? I will leave you with this ace photo my husband took. 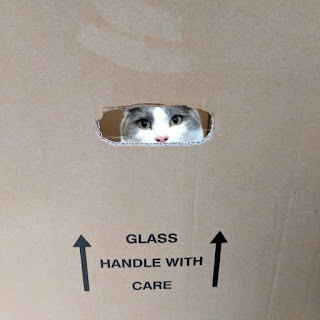 Teddy is doing well, she loves boxes and 'hiding'. I hope you're all having a good week and manage to take some time out to treat yourself! What was the last thing you did just for you? Always a joy to read your blogs. Love the pic of your cat. The Diwali procession looked amazing, and I love the photo of your cat. Fun quilt and fun times! The last thing I did for myself was to go see my dear friend who does Chakra realignment. I have been in heaven since! That's an easy one to answer today. Was feeling in a bit of a rut and got "new" hair which I hate. So ... bought a bit of Liberty last week, and Judith's robin cushion kit, have booked a superfood facial for my daughter and myself and am going on a girls scrapbooking weekend next week. Now if that doesn't lift my spirits, I don't know what will! Incidentally since when did beauty become such a big thing that we had to book two facials a month in advance?